So. My last encounter with Tomintoul wasn’t one of the best. 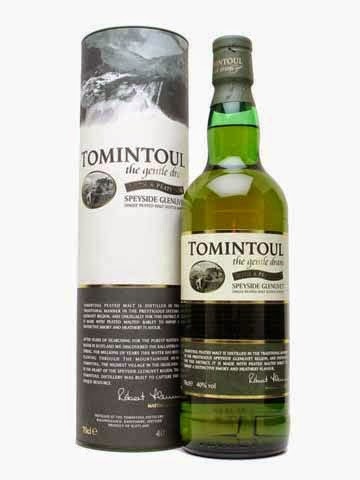 It was Tomintoul 10 year old, but to be fair, I have tasted very good Tomintouls, so let us see if the Peaty Tang can do it better than the 10 year old. Nose! Now this is much better!! It is like standing on the beach on a windy autumn day. And not the beaches in the Caribbean, but the northern beaches filled with seaweed. For a Speyside whisky it is very peaty, and some black pepper mixed with rose (or something other floral, not quite sure) comes to mind after a couple of minutes in the glass. The taste is very peaty as well, but still it lives up to the slogan “the gentle dram”. Very gentle indeed. There aren’t that many other flavours, but deep in the background you get some nuts and some raisins. My guess would be that it is too young to have gotten serious influence from the casks. This is NOT a complex whisky, but actually it works very well! Simple with a great smell/taste from start to finish, and very well balanced. I will give this whisky 83/100 (21/21/20/21).